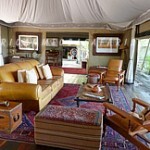 Zarafa Camp is where extreme green blends seamlessly with flowing canvas and opulent luxury. Each of Zarafa’s four large, sumptuous tents and its generous veranda is positioned under cool and shady trees with spectacular views onto the Zibadianja Lagoon. The spacious bedroom has a lounge, en-suite bathroom with copper bath, indoor as well as outdoor shower, copper heater for cosy winters as well as its own private pool for summer. 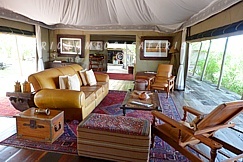 The main area is furnished in the same style as the tents and evokes the traditional safari ambiance of the turn of the last century. 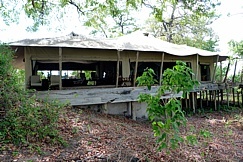 Lounge and dining facilities may be enjoyed under canvas or on the full-length deck shaded by giant broad-leafed trees, enjoying the expansive view and the wildlife that passes by. 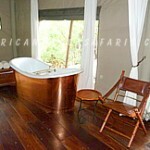 Activities are flexible to suit guests’ interests and include day and night game drives in custom-built 4×4 vehicles. 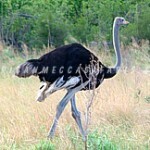 Guided nature walks from camp are also offered. 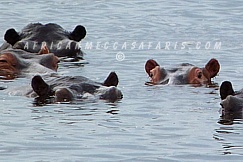 All of the Chobe wildlife is present at Zarafa with an interesting and varied bird life. The Selinda Reserve is a cloistered 135 000-hectare (330 000-acre) wilderness region which follows the floodplains of the Selinda Spillway, the waterway that winds its way through dry countryside to link the Okavango Delta in the west to the Linyanti and Kwando wetlands and rivers in the east. The full length of the Selinda Spillway winds its way through the Selinda Reserve and forms a magnet for the wildlife of the area. 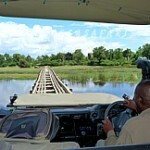 As Botswana is so flat, this river can flow in one of two directions or – as happens in some years – it can flow in both! Waters from the Okavango Delta discharge into the Selinda Spillway and flow from west to east. In the extreme east of the Selinda Reserve, waters from the Kwando and Linyanti rivers and floodplains force their way up the Selinda Spillway from east to west. Only in years of exceptional water levels in both these systems does the water that flows in from both the east and the west link up. 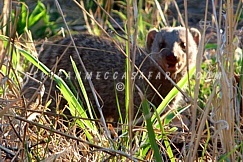 The Selinda Reserve is blessed with a diversity of habitats: wide-open savannah dotted with beautiful palm trees; thirst-quenching waterways surrounded by dry woodland; and the river systems and floodplains themselves. 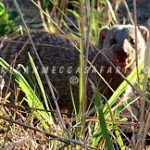 These waterways draw thousands of wildlife seeking to quench their thirst in the dry season. 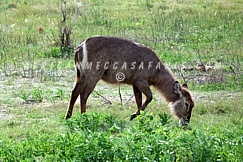 The floodplains close to Zarafa are host to a wide diversity of antelope and plains game. Game viewing are fruitful with a diversity of antelope, Burchell’s zebra, southern giraffe, blue wildebeest, and plenty of elephant and buffalo to be seen. 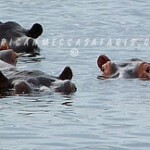 Predator watching is exceptional, including the incredible hippo-killing lions of Selinda, leopard, wild dog and cheetah. 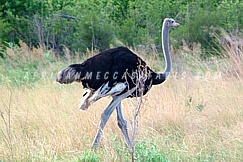 The Selinda Reserve is ecologically alike to the Linyanti Reserve but contrasts in the increased amount of its floodplains. Like the Linyanti, in the dry winter months, enormous herds of elephant remain close to the permanent water of the Zibadianja Lagoon (the Savute Channel’s origin) and the Linyanti waters. Game drives are fruitful with a variety of antelope, zebra, wildebeest, giraffe and buffalo to be seen.Predator viewing includes lion, leopard, wild dog and cheetah. 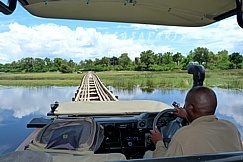 Morning and afternoon game drives via two 4×4 open Toyota Land Cruisers with removable canopies (8 passenger seats of which 7 are window seats). A specially adapted photography vehicle (Toyota Prado fitted specifically for those guests who want to photograph unhindered), available at extra cost, with 6 seats: 1 up front next to the guide, 2 behind the driver row and a back row of 3 seats. 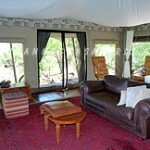 The camp has a supply of bean bags for guests to use to steady the camera while on game drive. Massage therapies are available either in the guest’s tent or on the deck outside their tent. 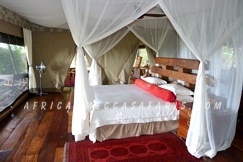 “Siesta’ viewing platforms plus hides at waterholes and at scenic locations within the reserve. 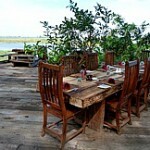 Brunch or sundowner cruises on the HMS Zib pontoon on the Zibadianja lagoon. 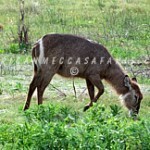 Fishing – Zarafa does have fly fishing rods at the camp with a limited selection of flies and lures. Avid fishermen are welcome to bring their own equipment along. The rooms are set up as double beds – but large single beds are available on request. 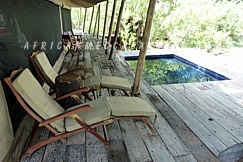 This camp usually accommodates a maximum of 8 guests but can accommodate a private group of 10 guests on request if the group accepts that they will have some in their party staying in the guide’s tent. 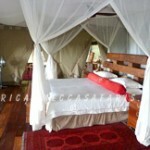 Spacious (1200 square foot) marquis-style flowing canvas tents with shaded verandas on raised platforms. 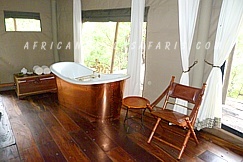 En-suite bathroom with basin, copper bath, flush toilet and both an indoor and outdoor shower. 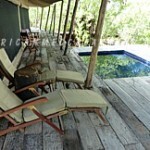 A private plunge pool per guest tent. 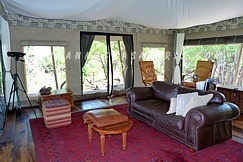 Main area has a large marquis-style canvas tent. Lounge, reading area, bar and dining facilities enjoyed under cover. 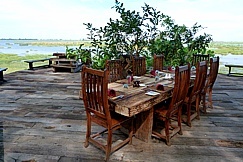 Meals are often enjoyed outdoors on the full-length deck shaded by giant broadleaf trees. The camp has a small open-air “Jungle Gym” for exercise enthusiasts with an exercise bicycle, rowing machine, punch bag and yoga ball. Children over the age of 8 years are welcome (and children under 8 years are welcome if the party books out the whole camp) however private activities need to be booked and paid for. The minimum age for canoe and walking activities is 12 years. 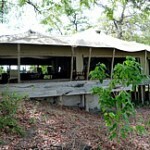 The camp uses the Selinda airstrip located about 40 minutes drive from camp.